There are so many demands that life can make on us and then just when we think we can't take another thing, we're asked to give a little more. Out of some sense of obligation or people pleasing issues, often times we agree to what is being asked of us. Our mouth say yes, but inside we're screaming no. It's hard to say no even though it's one of the first 10 words we learned & constantly repeated as babies/toddlers. Parents are always trying to teach little ones not to say no. Kind of funny that as adults we have to learn how to say no all over again. Lately I've been feeling the need to practice the art of saying no. No to things I don't feel comfortable with and things I honestly don't have time for (physically or emotionally,) or that I'm simply not interested in doing. Coming to this conclusion has been a painful process, but I'm looking forward to seeing the benefits in the long run. 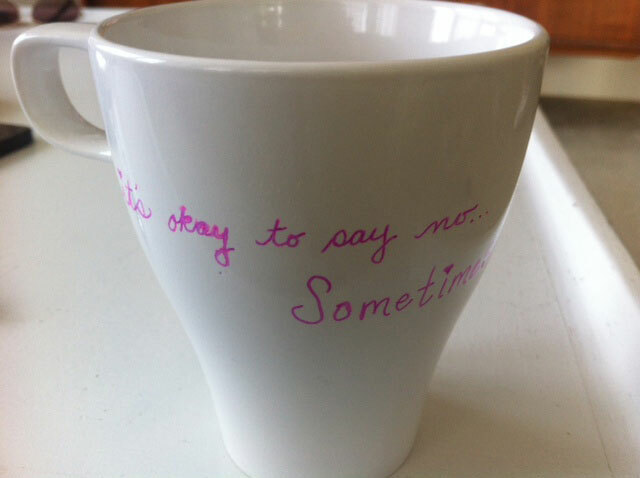 Just for fun, I made a little reminder that "it's okay to say no...sometimes." How about you? Do you have a hard time saying no? How do you feel afterwards?